Artlyst is excited as always to be scouring Frieze London 2015 for the very latest and greatest in contemporary art, having previously released our essential, online, Frieze and Frieze Week collateral Art Fair Guide, for London 2015, for the 13th edition of Frieze London taking place in The Regent’s Park, from 14 to 17 October 2015. Among the crowds, and hustle and bustle of art world dialogues on the opening of Frieze this year; Artlyst had camera in hand to bring you some of our favourite works from more than 160 galleries displaying their selected artists. 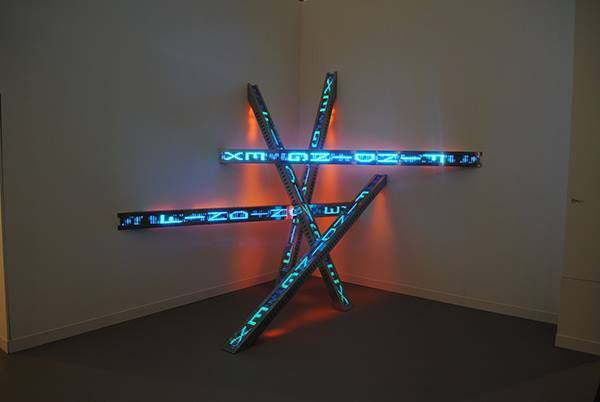 Jenny Holzer, All Fall, Spruth Magers, Frieze London 2015, photo P A Black © Artlyst 2015. Yngve Holen’s techno sculptures made from washing machines, plexiglass, and model airplanes play off Mark Flood’s Rothko pixelated paintings, after the artist took Googled Mark Rothko painting images and blew them up. The collaboration won this year’s Stand Prize, for outstanding presentation by a gallery, with the London-based gallery being awarded £10,000 and a very large-sized bottle of Pommery Champagne, the official sponsors of the award. At Booth B5, Lisson focuses on the relationship between colour and material juxtaposing the two artists differing sculptural languages. The stand presentation also includes works by Lawrence Weiner, Richard Long, Jorinde Voigt, Allora & Calzadilla and Stanley Whitney, who makes his debut with the gallery in his first solo exhibition in Milan this October. A particular highlight being The Iron Root by Ai Weiwei, a cast iron sculpture of a tree root sprayed in purple car paint, closely connected to the trees currently on display at the Royal Academy of Arts in London. 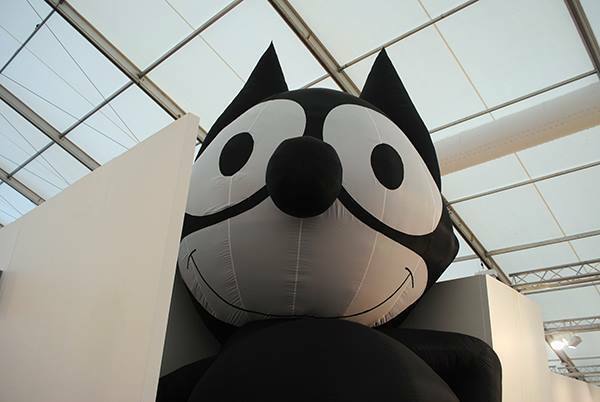 Probably the largest art work belongs to Galerie Buchholz, and Mark Leckey’s massive Felix the Cat balloon which drew a lot of attention. The iconic character was the first image to be broadcast on television and Leckey likens it to a “magical figure” to which the artist has hoped “people will leave offerings.” Other artists at the Galerie Buchholz booth include a sculpture by Simon Denny and a painting by Lucy Mckenzie. Mark Leckey at Galerie Buchholz, Frieze London 2015, photo P A Black © Artlyst 2015. Lead image: Cocktail Party, Tom Friedman, Frieze London 2015, photo P A Black © Artlyst 2015.